Do you remember that iconic photo of Princess Diana (above), of her walking through a mine field in Angola? It was taken in 1997, eight months before she died. Diana’s 1997 visit to Angola was extremely effective in terms of raising global awareness of the plight of landmine victims and the indiscriminate nature of the weapons. As you may recall, many countries came together later that year to sign the Mine Ban Treaty in Ottawa. Despite the Treaty’s huge success in stopping landmine production and transfer, the HALO Trust, which is the world’s largest humanitarian mine clearance organisation, says the Treaty’s proposed 2025 deadline for a mine free world will not be met without a substantial increase in funding for mine clearance. The harsh reality is that mines and unexploded ordnance are still harming civilians and hindering development in Angola – and in 63 other countries and territories around the world. 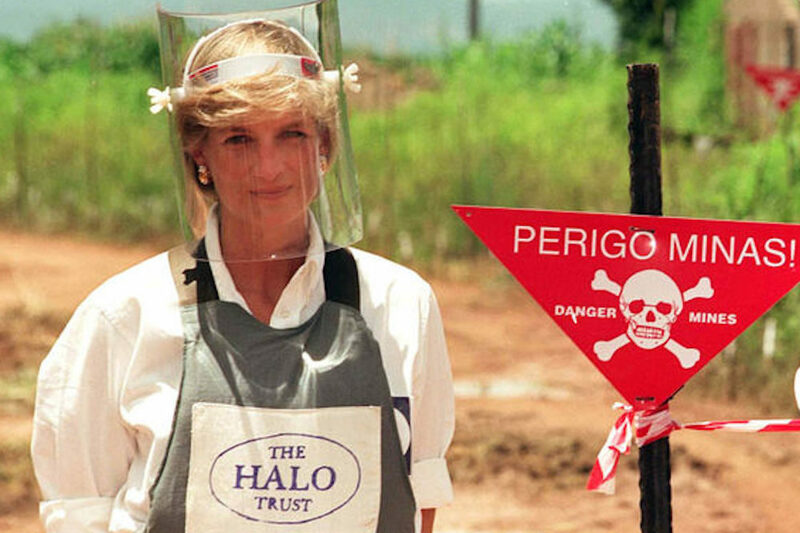 Since Diana’s 1997 visit, the HALO Trust has destroyed more than 95,000 landmines in Angola, cleared 840 minefields, and disposed of 164,000 shells, missiles and bombs safely. There are 680 minefields remaining in the ten provinces where they work. The minefield where Diana walked is now a thriving community with housing, a carpentry workshop, a small college and a school. But there is still much to be done. Most of the cities in Angola have been cleared but rural areas remain heavily mined and over 40% of the population lives in the countryside. A sharp decline in international assistance has forced HALO to reduce its local demining teams from 1,200 personnel to just 250 in the last few years. Today, fleets of armoured vehicles and specialist equipment are inactive due to lack of funds. Hundreds of trained Angolan de-miners are now unemployed. Meanwhile, estimates for the total number of casualties from landmines and explosive items in Angola vary considerably, from 23,000 to 80,000. The size of the country and length of its conflict have hindered efforts to keep reliable records. The slow progress of Angola clearance contrasts with that of Mozambique, which was finally declared free of mines in 2015 after 22 years of work by HALO and other operators. For more information, please visit the HALO Trust website. The cost of clearing a minefield varies depending on the size, geography, mine threat and local economy. On average, funding a team of deminers for a month starts at $5,000 and for a year can cost up to $100,000. If you would like to make a donation to the Halo Trust, here is the link. If you do make a donation by July 31st, please e-mail us a copy of your donation receipt from HALO Trust and we will match it – up to a grand total of $1000 in donations. To help spread the word on social media about the need for funding, please follow @TheHaloTrust. On behalf of those impacted by the devastation of landmines, thank you for helping bring about a landmine-free world.